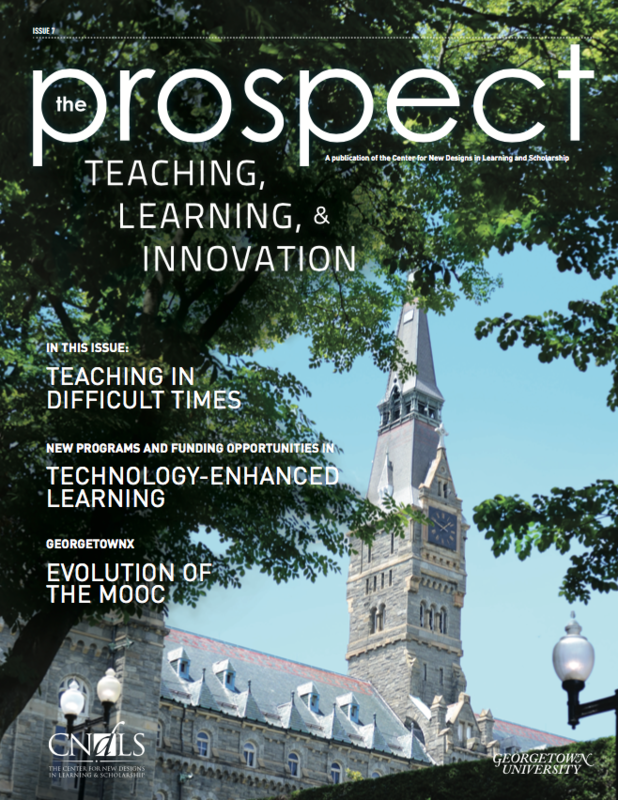 We're pleased to present the latest issue of The Prospect, a CNDLS publication designed to highlight innovative teaching practice at Georgetown. New WordPress 3.9 Smith from I for Ideas on Vimeo. Aside from the usual bug fixes, Wordpress 3.9 “Smith” features a few significant improvements in the incorporation of multimedia in blog posts. Photo galleries in the text editor now appear as a what-you-see-is-what-you-get preview, rather than a placeholder. Users can now include audio or video playlists in posts, and upload photos by dragging and dropping directly into the text editor. However, this feature requires uploading content to Wordpress. We remind users that the Georgetown Commons system has limited storage capacity, so please continue to create playlists on services such as YouTube or SoundCloud, and embed them in your posts or pages. When searching for a new theme, users can now edit the theme preview with custom headers and widgets without making any hard-to-reverse changes to their existing site. As with the added features in the post editor, these changes have moved Wordpress toward more intuitive content management. The Georgetown Commons team plans to add new themes and plugins in the coming weeks, so check back soon for those details. As always, if you have questions about any of the Commons tools, see the Knowledge Base wiki, or email the commons team at commons@georgetown.edu. Aside from the usual bug fixes, WordPress 3.9 “Smith” features a few significant improvements in the incorporation of multimedia in blog posts. Photo galleries in the text editor now appear as a what-you-see-is-what-you-get preview, rather than a placeholder. Users can now include audio or video playlists in posts, and upload photos by dragging and dropping directly into the text editor. However, this feature requires uploading content to WordPress. We remind users that the Georgetown Commons system has limited storage capacity, so please continue to create playlists on services such as YouTube or SoundCloud, and embed them in your posts or pages. When searching for a new theme, users can now edit the theme preview with custom headers and widgets without making any hard-to-reverse changes to their existing site. As with the added features in the post editor, these changes have moved WordPress toward more intuitive content management. The Georgetown Commons team plans to add new themes and plugins in the coming weeks, so check back soon for those details. As always, if you have questions about any of the Commons tools, see the Knowledge Base wiki, or email the commons team at commons@georgetown.edu. Posted June 30, 2014 by Katie Gach & filed under CNDLS, New Features.